Basecamp Classic: Can we export our Basecamp Classic data? Yes! 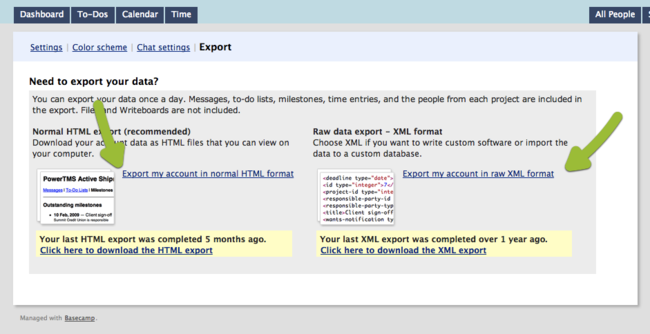 You can export your to-dos, milestones, events, messages, and comments as HTML or XML. NOTE: Files and Writeboards are not included in the export at this time. But our support team can help with getting the project files, excluding Writeboards, to you. If you are an account owner, click on the “Settings” tab from your Basecamp Dashboard then click the “Export” link. At the bottom of this screen you’ll see two export options. On the left is the HTML export and on the right is the XML export. Click the link to request the export you want. Your request will go into a processing queue, and as soon as your export is ready you’ll receive an email with a link to download it. The HTML export itself is a zip file containing all of your projects in HTML format. The files are organized in folders named after your projects. Messages, to-dos, milestones, events, time entries, and people are all included in the export. Double-click the “projects.html” file to easily navigate through the export in your web browser. You can click to view any project, and then drill down to a specific message, to-do, milestone, event, time entry, or person. Another option is to export your messages, comments, to-do lists, milestones, and time tracking data in XML (Extensible Markup Language), a general-purpose specification for creating custom markup languages. (We don’t recommend this unless you’re familiar with XML.) Learn more about XML at Wikipedia. We also offer an API that allows you to access your data from other tools that you use or create. Can I download all my files at once?